Background: The organic molecules represent one of the most active classes of compounds, and they have been widely used as active materials for important applications. In this study, the organic molecules and their derivatives with electron withdrawing groups in different positions were investigated to elucidate the influence of substituted groups on electronic and optical properties. Objective: In order to guide the synthesis of novel materials, some new organic compounds are designed as good candidates for nanoelectronics and solar cell applications. Methods: All the calculations are based on the density functional theory (DFT) at the B3LYP/6-31G level through the Gaussian 09W program package. Results: The optimized structures, total energies, electronic states (HOMO and LUMO), energy gaps and the absorption thresholds were performed. This study clarified that the electronic and optical properties are sensitive to the type and position of substituted subgroups. This leads to significant changes in the charge transport and the absorption spectra. The results showed a decrease in energy gaps and the presence of the electron withdrawing groups (such as CClO radical) leads to the absorption threshold in the visible region of the spectrum. Conclusion: The study of structural, electronic and optical properties for these molecules could help to design more efficient functional organic materials, and these properties play a key role in a variety of nanoelectronics and solar cells applications. Keywords: DFT, energy gap, Gaussian 09, HOMO, LUMO, Nanoelectronics, optoelectronic properties. Keywords:DFT, energy gap, Gaussian 09, HOMO, LUMO, Nanoelectronics, optoelectronic properties. Abstract:Background: The organic molecules represent one of the most active classes of compounds, and they have been widely used as active materials for important applications. 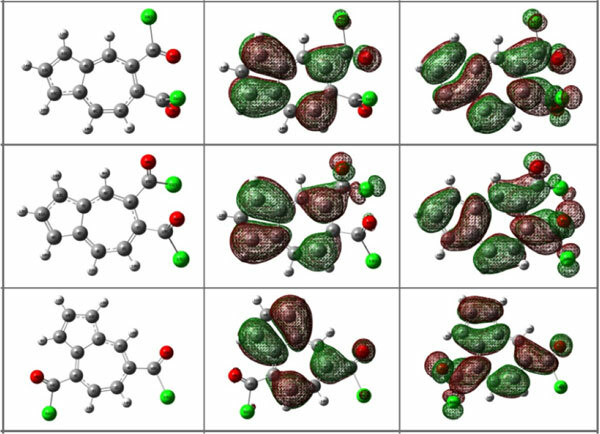 In this study, the organic molecules and their derivatives with electron withdrawing groups in different positions were investigated to elucidate the influence of substituted groups on electronic and optical properties.